Where do I use my O2 Recycle voucher code? Select the device you would like to recycle at o2. Select the network your phone is on and then Click ‘Sell my phone’. You will be taken to ‘Your details’ and you can now enter your code. Below ‘Order Summary’ is a text box, enter your voucher code here and click apply. Your total will be automatically updated with any credits or discounts received. "Get the best price with the top price promise." Recycle your mobile phones and earn money as you do it with the help of O2 Recycle. MP3, cameras and other gadgets are also accepted. In doing so, you contribute to keeping a greener environment while earning for disposing of gadgets lying around the house. Anybody is entitled to use O2 Recycle and it is a simple and easy process which can be completed in 5 simple steps. Firstly, search for your products whether it be a phone, camera, sat nav or ipod; you don’t have to be an O2 user either! Anybody on any network can use O2 recycle making it convenient for everybody. After finding your item, simply add it to your basket and head over to the checkout where your order will be placed. Remember to be prepared for shipping your item. Ensure you delete any personal data from your device and remove your sim and memory card. Make the most out of your recycled item and get the best price possible for your item by reading the T&C’s for useful, handy tips. Once your order is processed, package your item and send it over. Depending on your payment choice, you can be paid on the same day or within 5 working days and you can guarantee a fast, easy and reliable service provided by O2. Get instant cash for your old gadget now with O2 Recycle! Is your old device stuck in a drawer collecting dust? O2 have sold over 2 million devices so why not sell yours? It doesn’t have to be your old mobile, it can be your camera, tablet or ipod. You don’t even need to be an O2 customer. Its quick and easy and can be done from the comfort of your home computer. O2 promise to give you the top price and if you see something better, no worries, O2 will match it! O2 aim to guarantee satisfaction, ‘what you see is what you get’, and if you’re not satisfied, you can have your order back free of charge. What if my device isn't on the list? Unfortunately, if your device isn’t on the website O2 Recycle are unable to recycle it for you at this time. You can cancel your order by contacting the customer service team. How do I know if my device is water damaged? If you are not sure if your device is water damaged O2 Recycle will be able to check and confirm this when they receive the device and will update the value of your device accordingly. 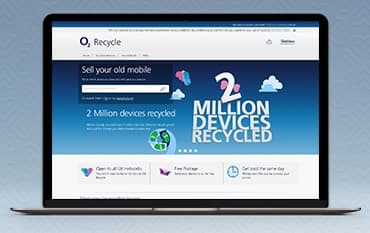 O2 Recycle take your old mobile phones, iPods, tablets, handheld games consoles and kindles for recycling and pay you for them. You don't have to be an O2 customer to use this service as it's open to everyone, whatever network you're on. They will give you a quote for your device and then send you out a free postage pack or, if you don't want to wait you can print a label to send it yourself. Then post your device to them for free. They will check your device over and pay you the agreed price on the same day that your device is processed. It couldn't be simpler!